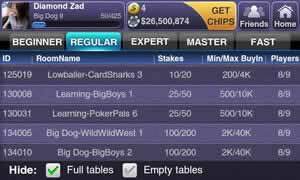 Call, Bluff and Bet Against Millions of Poker Players from Your Smartphone! Easy to find games online. Has some issues with stability. Ever since it was introduced to the good people of Las Vegas in 1967, Texas hold ‘em has gone on to become one of the most popular and widespread variations of poker in the world. In that regard, it can be kind of maddening when you just can’t seem to find the time or people to play the game with, even when you know there should be plenty of the latter. Now you can find both quickly and easily with Texas HoldEm Poker Deluxe! Go online to play classic Texas hold ‘em with your fellow poker players all around the globe. Hit the online tables, win big against the competition, chat with your fellow players, and make some new friends in the process. All the cards are on the table; all you need to do is take the plunge. Everything you know and love about classic Texas hold ‘em is right here in its entirety in Texas HoldEm Poker Deluxe! Enjoy and experience the classic game using the app’s intuitive interface and touchscreen controls. No need to spend any money. Just put your digital in-game chips on the line with a few taps of the screen. Win more to play even more poker. See if you can form a nice hand from your two private pocket cards and the growing stack of community cards. Place your bets every round. Call or raise the stakes if you think you can convince everyone that you have a winning hand. The last player still standing wins the pot. Pay close attention to your opponents’ betting patterns. They just might be bluffing. Fold if you just don’t have the stones for the current deal. Sometimes, it’s better to lose some now than to lose more later. Poker is a flexible game that can be structured in many ways. Whether you just want to hop in for a few minutes or are ready to commit yourself for a long time, Texas HoldEm Poker Deluxe has ways of accommodating you. Jump into a sit-n-go tournament to play a few quick rounds that you are free to leave at any point in time. Join a shootout tournament to experience some more involved poker. Be the last one standing in a massive game involving many tables playing all at once. Play at a table involving anywhere between five to nine players. Texas HoldEm Poker Deluxe is not just some cheap poker simulator that pits you against a predictable computer opponent. You’ll be raising the stakes against actual people all over the world. Chat with your fellow players while the game is in progress. Give yourself a unique pictorial avatar so that everyone can identify you at a glance. Make a list of friends so that you can play with people you like all over again. Add friends to your Facebook page and vise versa. For anybody who just wants to sit down and play a good round of cards with his or her friends, or even with complete strangers, Texas HoldEm Poker Deluxe is a godsend. It involves no gambling whatsoever; just that timeless game of betting and deceiving that we have all enjoyed for centuries. Download it for free on your iPhone, iPad or Android device, and start playing right away. As the modern phenomenon that is mobile gaming takes off, it was only a matter of time before one of the oldest forms of gaming latched on with vice-like grip. Card games like poker just have a timeless quality to them that won't ever let go. 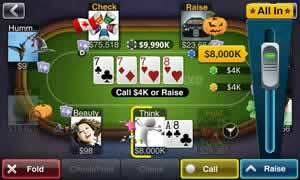 While there is undoubtedly no shortage of poker sims available for Android and iOS systems, Texas HoldEm Poker Deluxe stands head and shoulders over the rest. While its format means it can never truly capture the feeling of a physical game of poker, complete with everyone maintaining their best poker faces, it's still the best way to get a round going on short notice. It's also free. Most poker simulators aren't known for having fantastic visuals that make your eyes cry with joy. Free ones in particular are especially notable for being very bare bones. You got your cards, you might have some chips, and it's all played on a blank green screen. Such things are enough to get the job done, but they're still not much to talk about. Fortunately, Texas HoldEm Poker Deluxe aims a little higher on the visual front. It's not going to win any awards for technical or artistic brilliance by any means, but it at least makes the act of playing classic Texas hold 'em on a small computer screen feel a little more interesting. The game unfolds above the image of a casino poker table, while icons representing all the players surround it as though they're all seated around it. It's a small thing, but it does wonders at capturing the mood. That aside, the interface is well-designed as well. Touchscreen buttons for actions like checking or folding are visible in plain sight and appropriately labeled. Placing your bet is as simple a process as moving a slider up and down. Cards are readable, and you can see every card on the table easily regardless of the size of your screen. Information is conveyed very well, and there are few reasons to ever get confused. You can focus purely on playing the game rather than fiddling with the interface. It's right there in the title. If you want to play Texas hold 'em, then Texas HoldEm Poker Deluxe delivers nothing less and nothing more on that front. Every player is dealt two hole cards that are only visible to themselves. After everyone places their bets, three community cards are laid down on the table for everyone to see. From that point on, everyone has to make a choice based on what kind of possible hands they can make with both the hole cards in their possession and the community cards on the table. You have the standard options available to you. You can continue betting, you can raise your bet, you can check, you can call, or you can just cut your losses and fold. Once the next betting round is done, another community card is laid down. The betting goes on until one of two things happen: either one player stays in after the rest have all folded, or everyone shows their cards and the strongest hand is revealed. The winner gets all money in the pot, and the next round begins. Playtime is brisk and to the point. Every player has a limited amount of time to decide his or her next course of action. While this can make things a little hectic, it also ensures the game faces minimal stalls and flows at a steady pace. It also adds a nice amount of tension to the mix. That's good; poker just wouldn't be poker if it had no suspense. Sadly, Texas HoldEm Poker Deluxe can never imitate the real thing. A big part to poker is the gauging of your fellow players by reading their faces and movements. Bluffing and deception are enormous parts to the meta-game after all. That's all absent in this adaptation by sheer necessity. Hence, you're limited in what you can do. Bluffing is still a valid strategy; you can scare people into folding by betting high and tricking them into thinking you have a good hand. Likewise, you need to know when people are being honest with their bets, and when they're blowing smoke in your face. You just have fewer ways to pull either off. However, while much of the inherent strategy of Texas hold 'em has been lost, it can be considered a tradeoff for the extensive online community this game opens up for you. The player base is large and pretty active, with games that can accommodate up to nine people going on at all times of the day. There are "Sit-n-Go" tournaments where players can jump in and leave at any time, which is good if you only have a few moments to spare. Meanwhile, anyone that wants a more involved game can instead hop into a shootout tournament. These pit players on multiple tables against one another in a large match where there can be only one. It's a lot of fun. You don't need to make an account immediately either. If you just want to test the waters, then Texas HoldEm Poker Deluxe will allow you to guest. Signing up for an account will open up all sorts of perks for you. You can make a list of friends with your fellow poker players, or even integrate your buddies from Facebook. Either way, it's easy to form a circle of poker buddies once playing with complete strangers loses its charm. Risk is a natural cornerstone of poker, but this edition comes with an element of it that really is unwanted. While connectivity is always a concern for online games, Texas HoldEm Poker Deluxe has more problems staying connected than other online mobile games. The degree of how long a connection can last will vary from person to person, device to device, and machine to machine, but there have been some reports that otherwise stable people have been disconnected from HoldEm more often than usual. While this may not affect you, don't be surprised if you see a mate or two suddenly disappear from a game in progress. 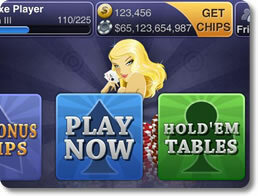 In the end, while Texas HoldEm Poker Deluxe has some notable flaws, it's still a very good online poker game. It has most of the intrinsic strategy of Texas hold 'em, a large community of real people to play against, strong networking tools, and plenty of opportunities to get into a round anytime and anywhere. The fact that the app is completely free is just icing on the cake. Anyone who gleans any sort of enjoyment out of poker needs to at least give Texas HoldEm Poker Deluxe a try. For the price it's asking for, it's definitely one of the best.